Nancy Pelosi officially became Speaker of the House today, as the Democrats took control of the House of Representatives. Donald Trump still hasn’t said much about today’s events, apart from a brief and meek appearance in the White House briefing room which saw him awkwardly heaping praise on Pelosi. Now Trump is finally melting down, but it’s not about Pelosi. Instead it’s about Trump’s old pal Mr. Pillsbury. Back when Donald Trump infamously held a press conference involving an attack on George Washington and a reference to “Mr. Kurd,” he also referenced “Mr. Pillsbury.” The phrasing and context led a lot of people to believe that Trump was either making up a fake person or referencing the Pillsbury Dough Boy, but as it turns out, Mr. Pillsbury is a real person – and Trump has once again brought him back into the fold. This comes even as the stock market continues to plummet as a direct result of Donald Trump’s failed trade war against China, and Apple now says its sales will fail to meet expectations this quarter as a result of Trump’s failed tariffs. 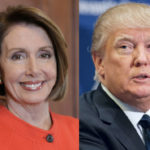 Trump can’t bring himself to attack Nancy Pelosi. Instead he’s apparently lying in bed, watching Fox News, and ranting about Mr. Pillsbury.